Arts, culture, history - we’ve got it all. No matter if you want to expand your knowledge at a science museum, explore world famous works of art, or step back in time at a history museum. Here, buildings themselves are works of art (Everson Museum of Art), space exploration comes within reach (Rochester Museum & Science Center or Milton J. Rubenstein Museum of Science & Technology), history comes to life, (CNY Living History Museum) and people ‘fly the friendly skies’ (Glenn H Curtiss Museum & National Warplane Museum). History was made, from the birthplace of the Women’s Suffrage Movement, to the resting place of Harriet Tubman. Cult classic films were inspired (It’s Wonderful Life Museum), and movies came to life with the addition of sound (Cayuga Museum of History & Art). People figured out how to freeze moments in time (George Eastman Museum) and playtime is taken seriously (Strong National Museum of Play). Art is made before your eyes (Corning Museum of Glass) and sometimes, those who have left us make an appearance at their old haunts (Erie Canal Museum). 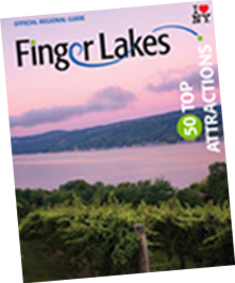 Explore all the museums the Finger Lakes region has to offer – you won’t be able to get enough and then we hope you’ll be coming back for more!